I'm about to start work on my next performance/recording run, and that means it is time to get a project specific notebook. 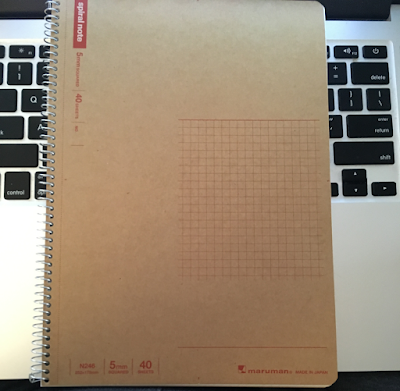 This time, it is a Maruman N246, a 40-page, 5mm grid spiral-bound notebook. What is this notebook madness? Well, I like to think of it in terms of an actual 'fresh start', and I like to have a notebook where I can jot down ideas, graphics, scoring ideas and hardware requirements. I like it to be spiral-bound (because it can lay flat, but also be folded upon itself for a smaller footprint), and I like a nice absorbent paper that won't also be hoover for food and drink bits. I've fallen in love with the Maruman series, because they meet all of those needs - along with one other serious thing. They are small. Only 40 pages. It means that I'm not overwhelmed with the requirements of filling up a huge notebook for this project - rather, I'll have to be a little constrained in order to fit it all in (or so I hope). Grid notebooks can be pretty efficient anyway, and I think this one will be a winner. I'll let you know in March and April, when this work should start seeing the light of day!